The tour began with our flight from Houston to Salt Lake City. Luckily, Trafalgar included the transfers for our flights. According to the vouchers, we were to meet up at a location near the luggage pick up and show our vouchers to the transfer agent. The transfer really made it convenient to get to the hotel. They picked up our luggage and even let us know when we were going to be arriving. Upon entering into the hotel, the first thing I noticed was that our Travel Director had a table set up with bags and goodies awaiting to check us into the tour. He introduced himself and let us know that our rooms were already ready and to head to the front desk to pick up our room cards. 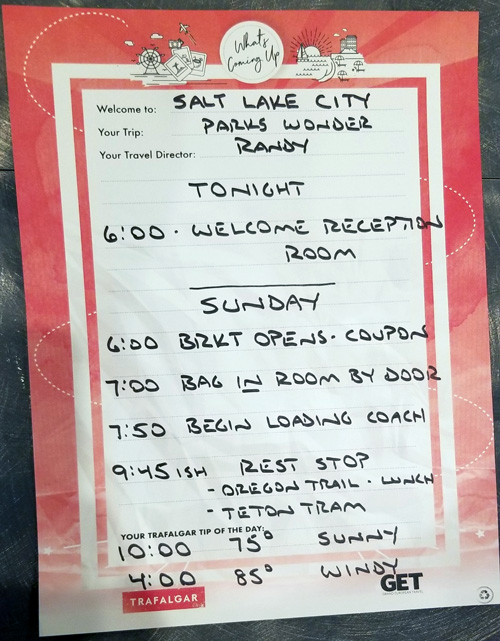 He then gave us a map of the area, highlighting the local attractions, circled nearby food locations, and let us know when and where to meet for our arrival celebration. He informed us that we would probably want food after as it was mostly tapas and finger food, with included spirits or wine. During the welcome reception our Travel Director gave us a brief history of the town that we were in, Salt Lake City, what was to be expected every day of the tour, and of him. He mentioned that every day he would be handing out a paper around the bus to let us know the tentative schedule. The next morning, we made our way from Salt Lake City to Montpelier where we had an included lunch at the Oregon Trail Center. This local attraction highlighted the plight that fell upon those who decided to travel across the states in hopes of gold, and of settling a new “untamed” portion of the country. 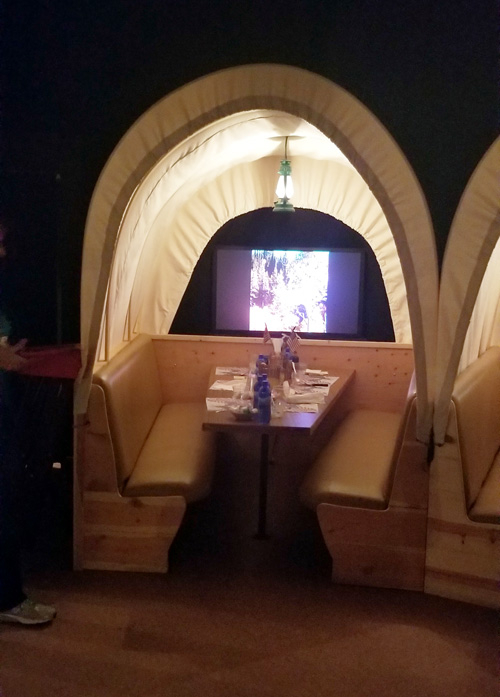 Each table was stationed in the back of a wagon. 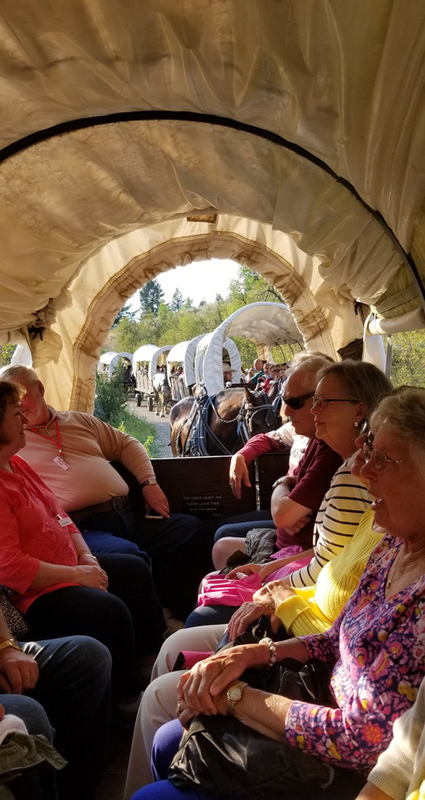 Afterwards we were given a tour of the establishment which included a mock Oregon Trail adventure and carriage ride. 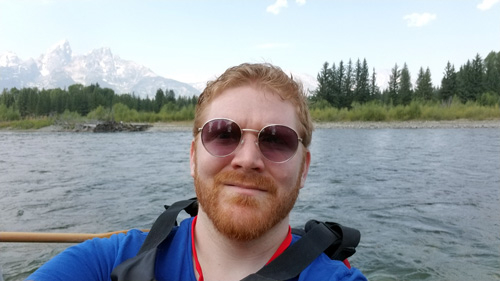 Shortly afterwards we were whisked away to Grand Teton National Park where we were offered the opportunity to do an aerial tram ride. Now, for those who don’t know what that is, you take a cable lift up a mountain for amazing views. Even though I have a fear of heights I decided to push myself and travel along with the group and I have to admit that it was worth; though, I truly wished that I had brought a jacket as the temperature at the top of the mountain dropped considerably and the wind was fierce. The ride up took about 15 minutes to reach the top and along the way you were able to see the whole sky lodge, as well as spectacular views. Due to the smoke, from the California fires, the view was a bit hazy but overwhelming nonetheless. After grabbing a cup of hot chocolate at the top of the mountain and spending some time taking in the view, the group headed back down and we were on the road again to Jackson Hole. 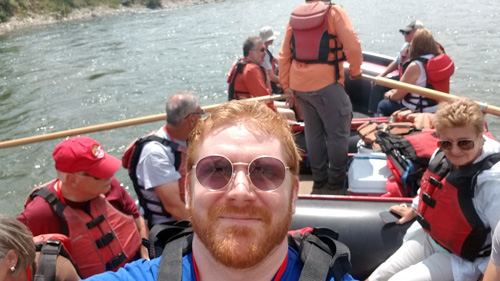 Day three began with an optional tour, floating down the Snake River, and I will admit it was completely worth every penny and second. The people who chose to go on the optional tour left in the morning and headed to the river, while those who decided not to had a free morning, as we were staying in Jackson that night. The River was moving slowly while on the town, due to both drought and time of the year. Our paddle boat guide educated us along the way, and even did his best to slow us down if we saw an animal along the way which included eagles, moose, and a bear. If there was one optional I would recommend over all the others, it would be this one. For anyone who wants to take in the view, relax with good company, and just enjoy the scenery, this is the one for you. The float down the river last about 2 hours long, and afterwards the group headed back to the hotel to grab some lunch. That night we were headed out to our regional meal: wagon chuck dinner and show. Now the dinner was open to the public, but Trafalgar not only got us the first two wagons set up to get to the dinner first, but had also reserved the first 4 tables closest to the stage, meaning that we had front row seating to the entertainment. Now this night was a real treat, we were fed an all-you-can-eat bbq, with hot chocolate/tea/lemonade, and the entertainment was a live band of fiddles and singers. The next morning, we were off to Yellowstone National Park, where we would be spending the next two nights. For those who are not aware, Yellowstone has a very high elevation. Despite that, Yellowstone overwhelmed me with its beauty and its peacefulness. I walked the geyser trail and hiked through the woods at night, and was able to see the Milky Way in all its grandeur in the middle of night. Related: Lowest Prices On Trafalgar Tours- Click Here! The first night we had dinner in the Old Faithful Inn with a 5 course meal where I had roasted glazed pheasant and an endless supply of mulberry pie. We watched Old Faithful erupt at one of its intervals but truly enjoyed watching the Grand Geyser as it pumps almost a three time amount of water reaching 200+ feet in the air. 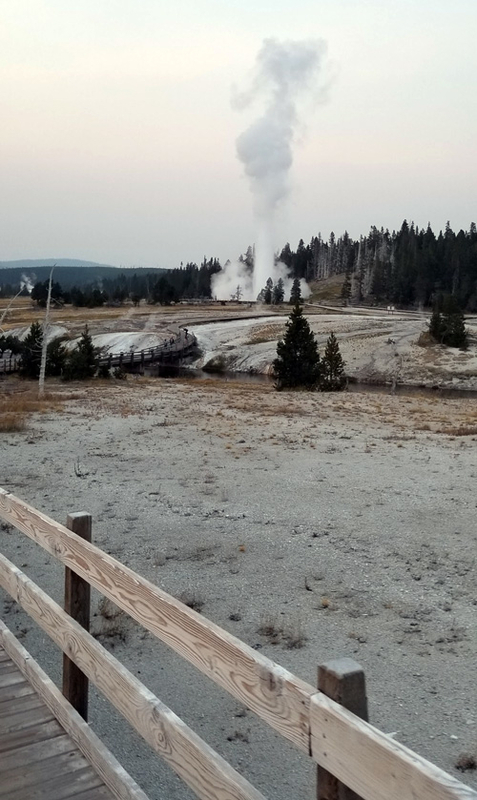 During our stay in Yellowstone we were also waking around the park and saw amazing waterfalls and different types of Geysers that outlined and spotted the whole area. Leaving Yellowstone was a sad moment as the place really gave me the peace of the outdoors that I was looking for. Cell phone service has been removed, no wifi in the rooms, and no tvs either and it truly gave you a moment to enjoy the wonder around. Regardless, we headed out way to Cody, where we stopped at the Buffalo Bill monument. Related: View All Trafalgar Tour Discounts! We left after lunch and headed to Sheridan where that night we would be having our included Be My Guest dinner at a local tobacco shop. Now, on most of Trafalgar’s itineraries they included a Be my Guest dining where the group will meet the owner of a local shop and be introduced to the culture and history of the area through food and stories of the family. We learned that the tobacco shop used to, once-upon-a-time, was a saloon and brothel owned by relatives of the owners of the shop. I was thoroughly tempted to purchase tobacco and cigars while I was there as is smelled unique and interesting. The next day we left for Deadwood where we went to go see the infamous Devils Tower where I decided to do a little off the beaten path jogging around the whole entire structure, which proved how much more I need to exercise. Shortly afterwards, we went to the Buffalo Bill museum, art museum, and cultural center. Now the museum is much bigger than it appears to be and I was entrapped by the Native American museum and cultural center where I got lost in information. I learned a lot in the time that we were there, and the lunch was really good, though I recommend looking around to see what you can find as there are many restaurants in the area. 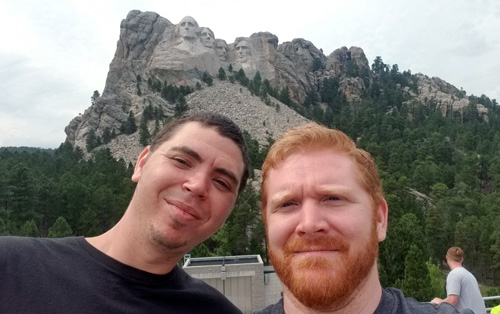 That night we landed in Rapid City and there was an option to go see Mount Rushmore at night. Now my travel companion and I decided to not do this optional, but I heard from the other travelers that it was very patriotic and a nice firework show, so I recommend it for those who want to see the monument more than once. The next morning was another optional tour to the Black Bear reservation, which I highly recommend. This excursion was a drive through zoo, where animals roamed around free, even crossing in front of the bus and blocking the way. It is truly the way that you can guarantee to see animals that you may have missed otherwise. It also gave a great opportunity to go see the black bears in person. After the animal visit we left to go see the Crazy Horse memorial, currently still in creation. This monument was a thank you and remembrance to the Native American people who established the area. Interestingly, the monument builders refuse to use government grants and use the profits from the gift shop and the area to pour into the building of its structure. Lunch lasted just long enough for us to get our fill and then we headed to Mount Rushmore. Now for those who don’t know, it is pretty windy in the area because you are essentially in the face side of a mountain. There is a trail that wraps around and lets you get a closer look at the monument, which I suggest that you do as a lot of people tend to crowd around the front of the steps to get a similar picture as the one above. Lastly, as our trip was coming to a close we had a farewell dinner and a Cultural Insight. I will admit that the insight was honestly one of the most moving and informative events I have ever seen. 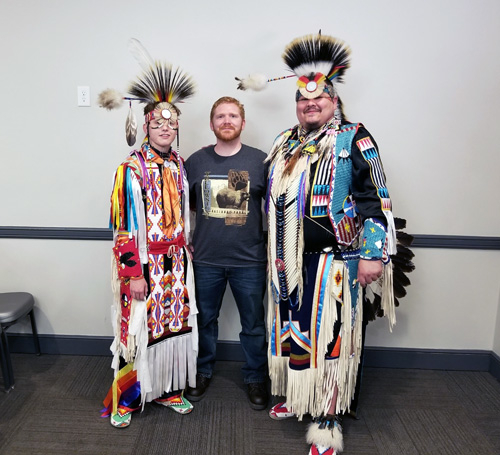 They had Stephen Yellowhawk come in and talk to us about his culture, part of the Lakota people, and they gave us a historical dance and songs that chilled me to the soul with its power and presence and if I had the opportunity to see it again I would sign up in a heartbeat. It was profound and I found myself moved to tears with its cultural ties in our country’s history. For all those who read this, I will say this: this trip was well worth every penny and time I poured into it. It highlighted historical and cultural aspects that I had never considered and truly made me appreciate a lot of the world and truly made me look at this country differently. The people I was on the trip with were lively, loving people and despite our age gap had fantastic conversations. I really lucked out that when I went it was not too hot, not too cold and it never rained until the very last day. For those seeking insight into our history, to those who want to experience the midwest, this is the Trafalgar trip for you.